Our company puts a premium on the green factor in home improvement. This is why our building products are the most sustainable you could ever find. We find the right balance among beauty durability, efficiency, and affordability. We transform homes to be better in the most budget-friendly way possible. If you choose us for your replacement window, siding, or roofing, rest assured that you wouldn’t need to spend on the same remodels for the decades. Compared with other contractors, our company is certified by many of the industry’s leading brands. For your roofing in Fairfield, CT, we’re a GAF Master Elite™ and a CertainTeed Master Craftsman. In siding, we’re a 5-Star Siding Contractor from Certainteed and a Certified Vinyl Siding Installer from Vinyl Siding Institute. In replacement windows, we’re a distributor of Renewal by Andersen® products. We’re also a 3-Star Velux Skylight Specialist. Our manufacturer’s certifications speak of our excellence in all areas of business. Our credentials also tell you that we’re licensed, insured, and reliable. Our company is a consistent recipient of the Angie’s List Super Service Award. As one of the most prestigious third party recognitions in the country, Angie’s List offers a constant validation that our customers are always satisfied with our work. At Vinylume, our manufacturer’s warranties are made stronger by our own Triple Protection guarantee. This covers any workmanship and labor costs on everything we install. Whether it’s for your White Plains roofing system or your new windows, expect us to come and fix any issue. 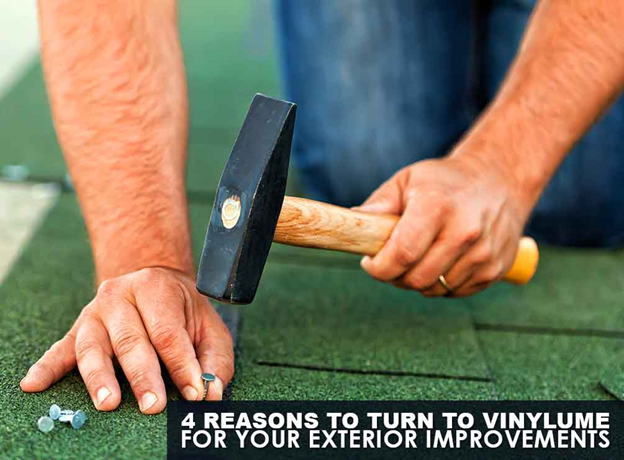 If you’re looking for an exterior remodeling contractor you can trust, your search ends with Vinylume. Call us now at (866) 244-8029, and schedule your free consultation to discuss your home improvement needs.